I take particular interest in pedestrian tunnels, as I believe properly designed tunnels can be a solution to improving access to stations. This list will be extended as I photograph more. I still think of this tunnel, as an escalator connection, as that was how it was marked on the tube map in the 1950s. It is two escalators down a walk between the Docklands Light Railway platforms and then two escalators up at the other end. Verdict – The connection is being upgraded. This is the shortest way from the Central Line to the Northern Line. It does involve a descent of a circular staircase. When the Bank station upgrade is complete this route will be replaced by an escalator connection between the two lines. This visualisation shows the connecting escalators. The two wide highest level tunnels are the Central Line. The infamous curved Central Line platforms,create a large gap to mind. 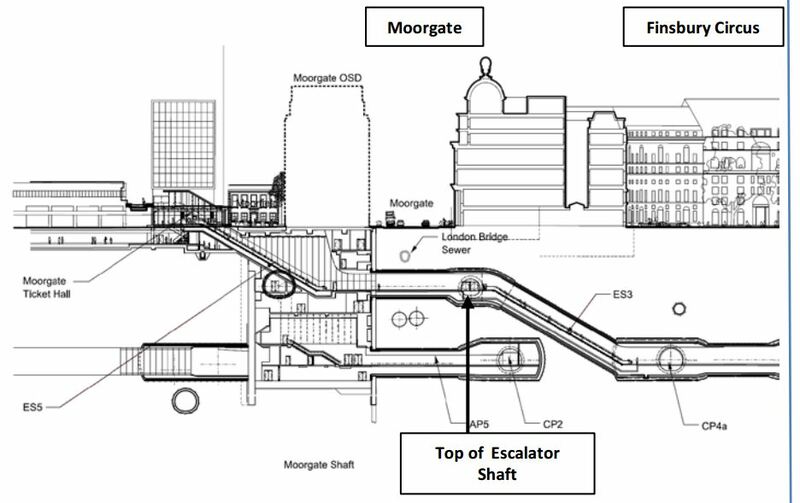 The two mid-level crossed tunnels are the existing Bank and Monument Escalator Connection and the Waterloo & City Tunnel. The four narrower lowest level tunnels are from bottom to top; the Southbound Northern Line, a new tunnel with a travelator; the old Southbound Northern Line tunnel and the Northbound Northern Line tunnel. The old Southbound Northern Line tunnel will become a passenger walkway. Poking through all this spaghetti are the three escalators connecting the Central Line level with the Northern Line level. Verdict – This connection will become much better. The inclined travelators that link the Waterloo & City Line platforms and the main station entrances around Bank junction, are unique on the London Underground. There are other travelators, but no others are inclined. Verdict – I wonder why there are no others, as this pair seem to work very well. This tunnel connects the Waterloo & City Line platforms at Bank station to the central tunnel at Bank station. Verdict – It is a linear oasis in an otherwise dingy and cramped station. This new tunnel connects the new Northern entrance at Bond Street station to the platforms. Incidentally, I’d arrived at Bond Street station through the main entrance and it was an awfully overcrowded scrum. The Northern entrance was quiet, as the pictures show. The entrance is steps or a lift between the street and its own gate line and then a well-lit wide passage to the escalators. In future, it will link to a wide tunnel to the Western end of the Crossrail platforms at the station. It is much better way to enter Bond Street station. Verdict – London and other cities with underground railways, need more new station entrances like this. This tunnel connects the Jubilee, Piccadilly and Victoria Lines at Green Park station. The opening dates of the three lines, through the station were. Piccadilly Line – 1906 – Modernised in the 1930s with escalators. Since 1979 the station has been continually improved and is step-free. 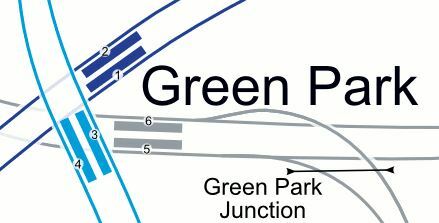 This map from carto.metre.free.fr shows the lines at Green Park station. 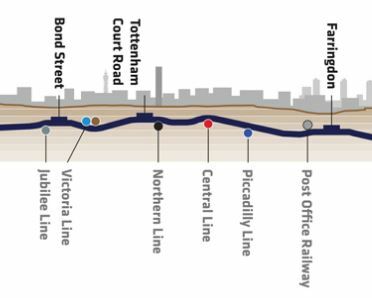 Note that the Jubilee Line is below the other lines and when the extension was built, it was a radical change to what was originally planned. 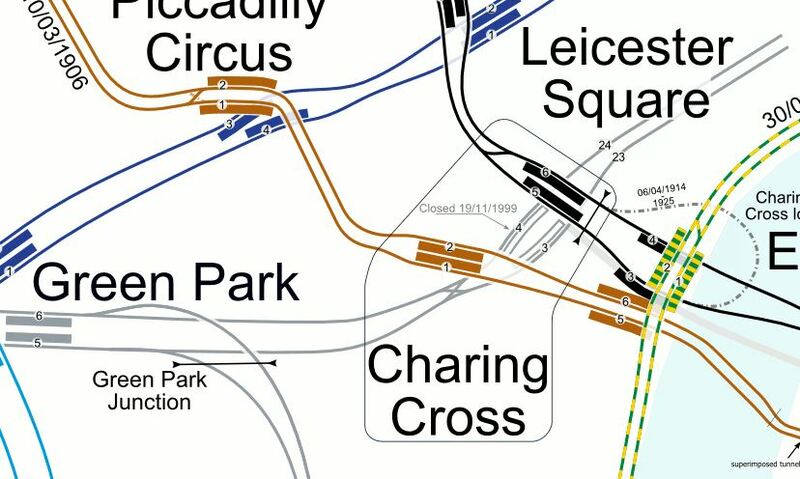 The lines to the right lead to Charing Cross station and those going South to Westminster station. The interchange tunnel is long and usually very crowded. I had an incident recently, where I was walking slowly to the Victoria Line and a group of tourists all with four-wheeled cases, were nudging me to go faster. When we all got to the steps at the end, there was an enforced slow down. Verdict – I avoid interchanging at Green Park like the plague. This tunnel runs which used to be part of the access to the old Kings Cross Thameslink station, runs from East of Kings Cross station and then has access to the main tunnel connecting the Northern, Piccadilly and Victoria Lines. It has partial escalator access at the Eastern end, where the buses from Islington and the East stop outside the old station entrance. Although getting buses to the East mens crossing the busy Pentonville Road. This tunnel connects the Eastern Tunnel at Kings Cross to the escalators and lifts that lead to the Northern ticket hall Kings Cross St. Pancras tube station. On the way is connects to the Victoria, Piccadilly and Northern Lines. It is a long walk, especially, if you have accessed it, as I often do, from the Eastern Tunnel which is convenient for buses from Islington and Dalston. This tunnel connects St. Pancras station to the Northern ticket hall at Kings Cross St. Pancras tube station. It is a wide, comfortable tunnel with a double handrail down the middle. Note that the middle picture shows the connection to the next tunnel. Verdict – Useful and a better walk than the surface alternative in cold or wet weather. This tunnel connects St. Pancras Square to the underground tunnel, that links St. Pancras station to the Northern ticket hall of Kings Cross St. Pancras tube station. It is a good example of how to create a tunnel. It has up and down escalators at the St. Pancras Square entrance. Verdict – Good design and a pleasant walk. This tunnel at Knightsbridge station was built in 2010 to connect the new entrance on the North side of Knightsbridge. It looks to me that Transport for London had to make do with less space than they needed. Verdict – Rather narrow and utilitarian. This project to create a pedestrian link between the Bakerloo Line and Crossrail at Paddington is currently being built. It will be one hundred and thirty metres long. 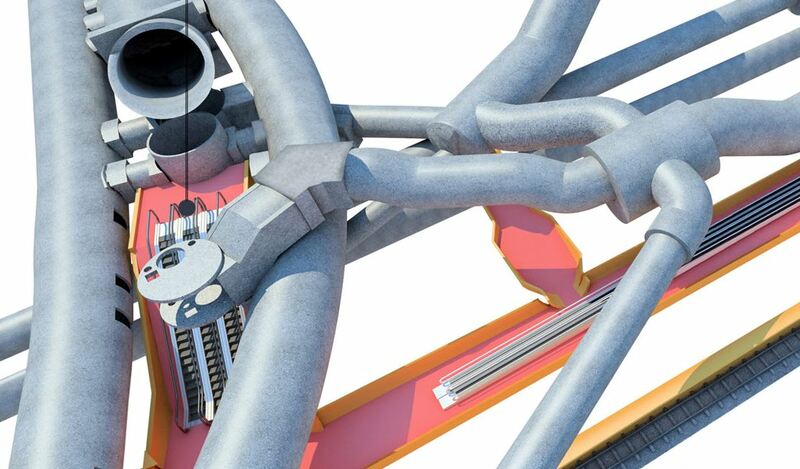 It will be twenty-five metres below the Paddington station concourse. The design uses a route to avoid existing station facilities. The tunnel is being built without major disruption to Bakerloo Line passengers. It will have lifts and escalators at both ends. The tunnel will handle five thousand passengers per hour in the Peak. In August 2016, I wrote Paddington Is Operational Again, which describes the tunnel in detail. Verdict – I have a feeling that this could be one of the most impressive parts of Crossrail. I can’t wait for this tunnel to open. The Exhibition Road Pedestrian Tunnel at South Kensington station is unique in London, as it was built in 1885 and it is Grade II Listed. As the pictures show, it can get very busy. Verdict – A Victorian idea, that hasn’t been copied much. This tunnel connect the Central and Northern Lines at Tottenham Court Road station. It is a bit lacking in colour to my liking. But at least there is some of Eduardo palotzi’s tiles at one end. Verdict – Bland and too long. Victoria station has had a new entrance at Cardinal Place and a lot of new tunnels to sort out the poor connectivity, added in the last couple of years. As the pictures show, not all the tunnels are finished. 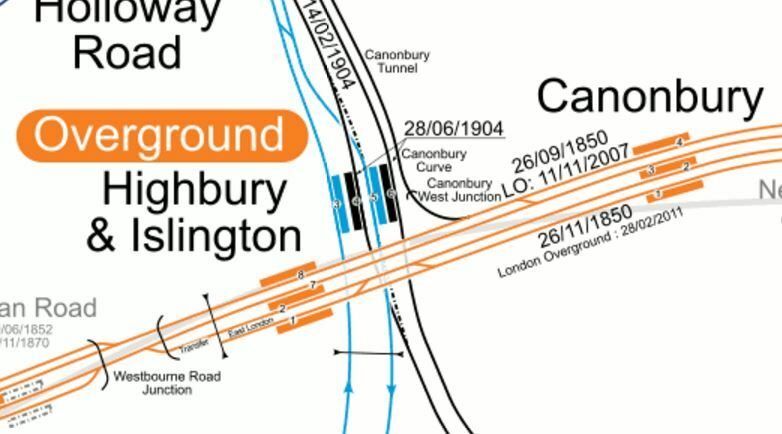 This map from carto.metro.free.fr shows the Underground lines at Waterloo station. Note the large separation of the platforms of the Jubilee Line and those of the Bakerloo and Northern Lines. The solution was to install a travelator, when the Jubilee Line Extension was built. Although expense wasn’t spared on the project, I think we would give it a more decorative lining today. There are two staircases between the District/Hammersmith & City Lines and the East London Line, that are being refurbished for Crossrail. It looks like the work is of a high quality and that the old rails have not been replaced. Verdict – These were scruffy tunnels a couple of years ago. Some tunnels are obviously better than others, but what surprised me, was how well the Exhibition Rpad Tunnel to the museums coped with large numbers of passengers. Perhaps, the Victorians got it right, as some of the best tunnels in my examples are the wider ones. Comparing the Northern Exit Tunnel at Knightsbridge with the Northern Entrance Tunnel at Bond Street, shows how a wide tunnel and entrance, built with a lift, is a much better solution, than a narrow tunnel and entrance, without a lift. The only narrow tunnel, that seems to work well is the tunnel connecting the Waterloo & City Line to the main Bank station complex. But this tunnel is well-lit and I suspect tends to have passengers going the same way most of the time. It also appears that recent tunnels like those at Bond Street and Victoria, are much better than those built about ten years ago, like the tunnel at Knightsbridge. 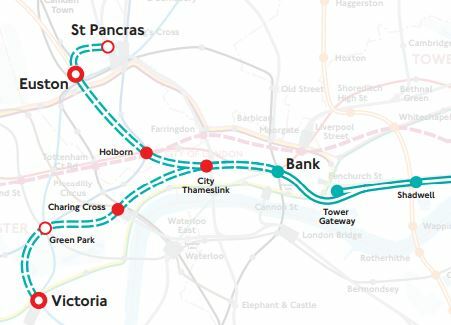 After Crossrail, London has a number of large station projects in the pipeline, some of which will require new connecting tunnels for passengers. The upgrading of Bank station is underway, where tunnels are being dug and escalators, travelators and lifts and being installed. The upgrading of Knightsbridge station is underway, but this will be simpler and I don’t think the upgrade includes more tunnels. The upgrading of Camden Town, Holborn and Walthamstow stations are in the planning stage. All will probably involve creating a new entrance connected to the existing platforms with lifts and escalators, but no long tunnels. Oxford Circus station is likely to be the subject of a major upgrade. Euston and Euston Square stations are being upgraded for the arrival of High Speed Two and there will be new tunnels to dig, between the two stations. There are also possible new lines to consider, which may or may not be built. Docklands Light Railway to Euston, St. Pancras and Victoria. All will be built with lots of entrances and exits, and interchanges with existing lines, so it is likely, there will be quite a few connecting tunnels. I think that three tunnel projects will define a lot of the thinking about pedestrian access in the future. The Northern Entrance Tunnel at Bond Street, which surfaces in a commercial development. The Paddington Bakerloo Line Link, which appears to be setting new standards of design and construction. The narrow well-lit tunnel at Bank. Could we see lessons learned with these newly-built tunnels applied to projects like Oxford Circus and Euston stations? The title of this post is the same as that of this informing article on Ian Visits. The title probably, says it all and Ian describes how London always seem to have a spare tunnel, where it is needed. I took these pictures on the Southbound platform of the Northern Line at Bank station. They show the old Victorian lining to the tunnel. 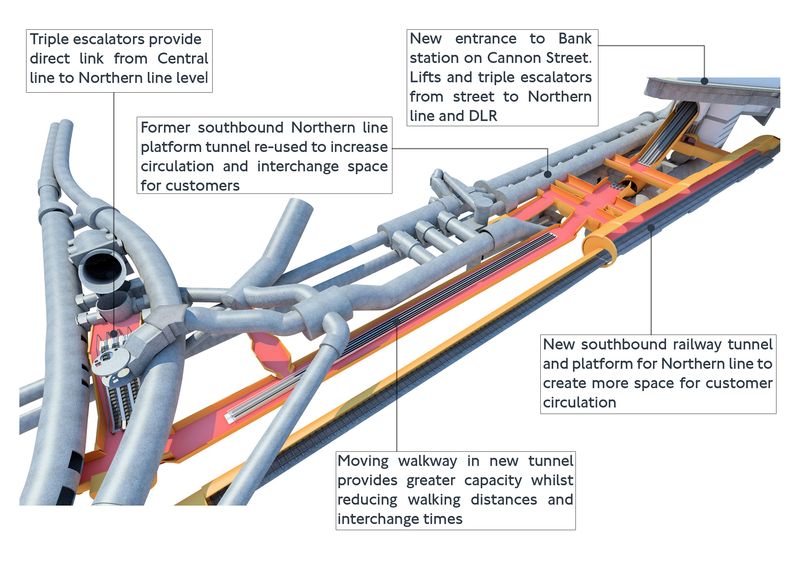 This visualisation, shows what the new Bank station will look like. The current two Northern Line tunnels are furthest away in the visualisation, with the Northbound one on the outside. The lines are aligned left sides together, which is opposite to normal British practice. The stairs that lead down from the passageways in the middle, where the tunnel size changes to accommodate the current platforms. The plan looks to be as follows. A new Southbound tunnel will be dug to by-pass the current station. This tunnel is shown in the foreground. The current Southbound tunnel will be closed to trains. Southbound trains will be diverted to the new tunnel and possibly pass through Bank station without stopping for some time. The former Northern tunnel will be used to increase space for the Northbound platform. Could the fitting out of all the tunnels in the middle be done last, with trains passing through on the outside? A similar procedure was used at Angel, which explains the extra wide Southbound platform. The title of this post, is the same as that of this article in City AM. 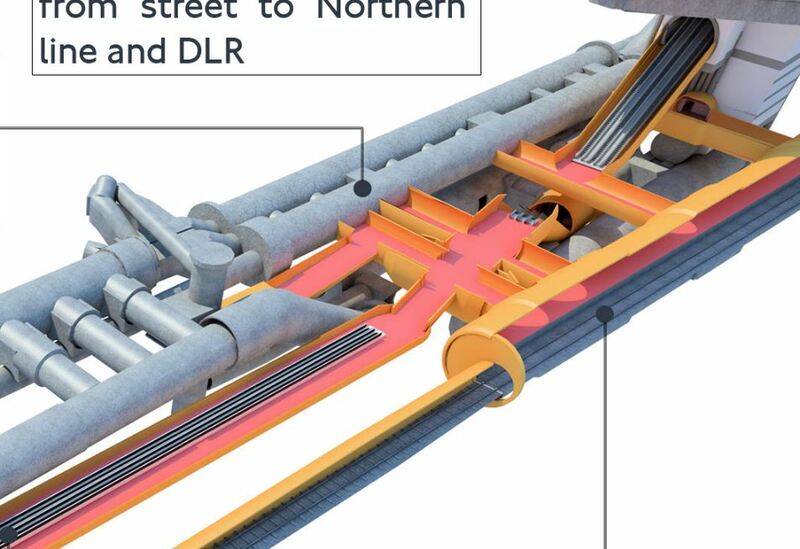 The hefty upgrade work on Bank station is set to be completed later than planned, and over budget, according to new papers from Transport for London (TfL). TfL said in its recent investment programme report that final costs for the revamp at Bank are set to be £642m, £19m higher than the £623m originally forecast. That covers a capacity boost and systems integration upgrade at the station. Other facts can be gleaned from the article. Overall works will now finish in 2022 instead of the original date of late 2021. £322m has been spent so far. Opening of the new entrance to the Waterloo and City Line has been put back from January to March next year because of problems of obtaining fire doors with the correct specifications. At least though, the contractors seem to be keeping all the lines open, as they carry out this most complex of projects in the heart of the City of London. Once the station is completed, it will be interesting to see how many billions of pounds worth of office space are built on top of the new Underground complex. I never took the connection tunnel between the Waterloo and City Line or Drain platforms at Bank station to the escalators that eventually get you out into the air by Lombard Street, where I used to visit clients at a major clearing bank. I doubt, it was as good as it is now! I was travelling home from Waterloo using the Drain and once back on the surface, I just crossed King William Street and got a 141 bus home. It might be upwards of a hundred metres underground, but it’s light, airey and traffic-free. We need more pedestrian tunnels like this under London. Obviously, it wasn’t Rush Hour! As I passed Bank station, there was a lot going on in the area and in the short walk to Cannon Street station. What is happening on the surface, is only small beer compasred to what is going on under the ground. Completion dates look like 2017 for the Walbrook entrance and 2021 for the completed Bank station. I think that this development will have one of the largest effects of any transport-related project in London. Do We Need More Angels? Before my reader, thinks I’ve gone all religious, I’m talking about the Angel tube station. The station was substantially rebuilt in the early 1990s and this is said in Wikipedia in a section about the rebuilding. For years since its opening, the station regularly suffered from overcrowding and had a very narrow island platform (barely 12 feet (3.7 m) in width), which constituted a major safety issue and caused justified fear among passengers. Consequently, the station was comprehensively rebuilt in the early 1990s. A new section of tunnel was excavated for a new northbound platform, and the southbound platform was rebuilt to completely occupy the original 30-foot tunnel, leaving it wider than most deep-level platforms on the system. The lifts and the ground-level building were closed and a new station entrance was opened on 10 August 1992 around the corner in Islington High Street together with the northbound platform while the southbound platform opened on 17 September 1992. Because of the distance between the new entrance and the platforms, and their depth, two flights of escalators were required, aligned approximately at a right angle. So that explains why the station is unusual and safe. Rather than unusual and scary! This map from carto.metro.free.fr shows the layout of the tunnels through Angel station. Note the dotted lines of the original tracks. The track to the North (top) was the original Northbound track. The Southbound track still has the same layout. The original twelve-foot island wide platform has now been widened to create the platform labelled 2. The platform labelled 1 and the track labelled 1992 is new work. The other dotted line was a siding. I suppose the only complaint, is that the new station is not step-free, but then the work pre-dated the time from when disabled-access became commonplace. London Bridge station went through a similar process in the late 1990s. 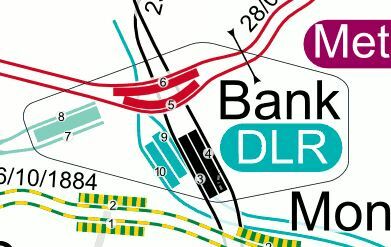 This map from carto.metro.free.fr shows the track layout of the Northern and Jubilee Lines at the station. 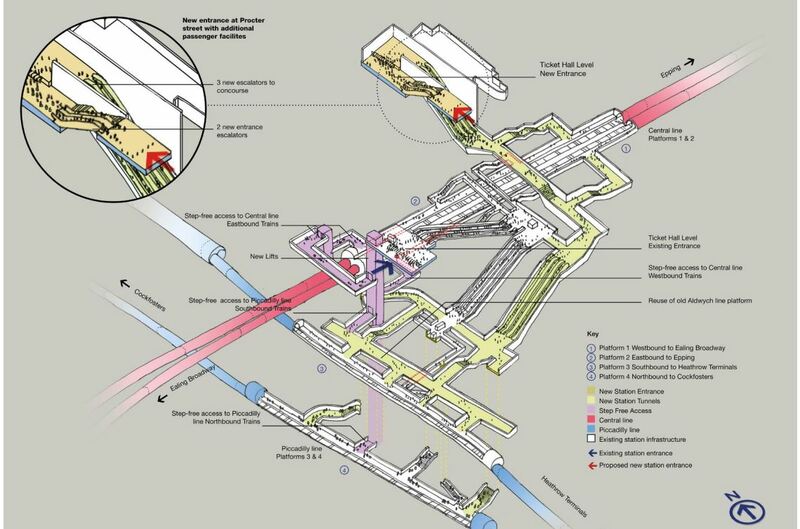 The work that will be carried out at Bank station follows some of the things that were done over twenty years ago at Angel. This map from carto.metro.free.fr shows the current layout at the station. Note the following about the current layout and future developments. Platforms 3 and 4 are the current Southbound and Northbound platforms respectively, with non-traditional on the right running. A new single-track Southbound tunnel is being built to the West of the current one, to create a space between the lines. The current platform 3 will become part of the passenger space as it has at Angel. Better step-free access is being created. There will be escalators direct to the Central Line. Oversite development is being added on the top of the new station entrance on Cannon Street. In some ways too at Bank station, the precedents set by the new Walbrook Square entrance are also being followed. I think more stations can be rebuilt along using similar techniques. Clapham North and Clapham Common stations are the last two Northern Line platforms with an island platform in the tunnel and must be towards the top of any list. This map from carto.metro.free.fr shows their locations. 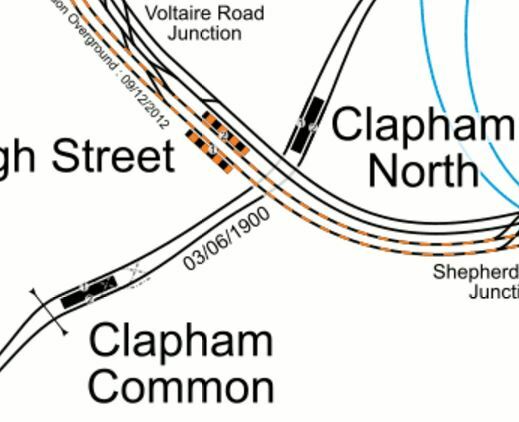 Note their closeness to Clapham High Street station, I am sure, that eventually a better solution to these two stations will come about because of property development in the area. Euston station must be added, but this will probably be sorted with HS2 and the rebuilding above. Camden Town station is planned for a major upgrade with property development on top. Finsbury Park station is being improved, but given the station’s future importance, is what is planned enough? And then there is always Highbury and Islington station, which is probably the worst station on the Victoria Line for platform access. 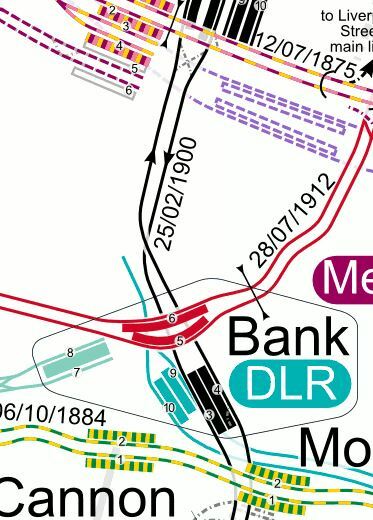 This map from carto.metro.free.fr shows the lines through the station. Note the following about Highbury and Islington station. The Overground has been sorted with step-free access. The bridge outside the station, which was decidedly dodgy will be fixed soon. Islington Council have ambitious plans for Highbury Corner. The Northern City Line is being upgraded to a high frequency with new Class 717 trains. The frequency on the North London Line is going to be increased a notch or so. There will be more trains to the South on the East London Line. The Victoria Line is going to get closer to forty trains per hour. All of this adds up to a desperate need to rebuild the station with more escalators and lifts, probably on both sides of the Holloway Road. There is a further unlikely possibility at Highbury and Islington station. 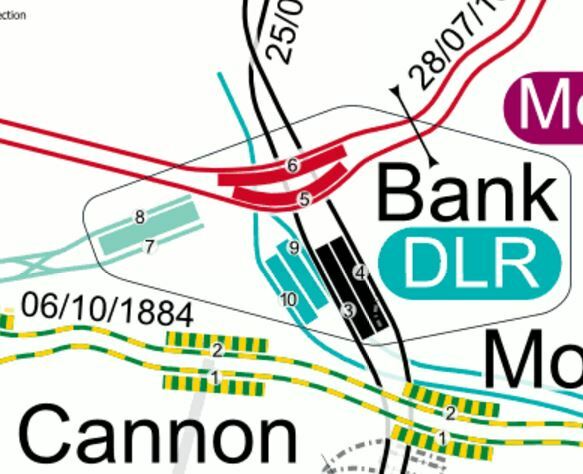 Note the Canonbury Crurve in the map, which lies on a single-track electrified line that links the North London Line to Finsbury Park on the East Coast Main Line, Thameslink and the Northern City Line. If, as I suspect, that in a few years the Northern City Line is upgraded to a higher frequency, once the new Class 717 trains, there will be an even bigger need to sort out this station.